The submarine cable installation works for the Asia Submarine-cable Express (ASE) cable system were commenced on 8 October 2012. This is the Second Weekly Impact Water Quality Monitoring Report presenting the impact water quality monitoring conducted during the period from 15 October 2012 to 21 October 2012 in accordance with the Monitoring and Audit Manual (EM&A Manual). During the reporting period, submarine cable laying works were conducted in Zone C and from Zone C eastward to the boundary of Hong Kong marine waters. Two monitoring events were scheduled in the reporting period in Zone C. Monitoring events at designated monitoring stations in Zone C were performed on schedule. Exceedances of Action and Limit Levels were recorded during the reporting week. However, the exceedances were considered to reflect natural background fluctuation rather than impact caused by the Project. No complaint and summons/prosecution was received during the reporting week. During the following week, there will be cable installation works from Zone C eastward to the boundary of Hong Kong marine waters which are outside Zone A, Zone B and Zone C. Hence, no impact water quality monitoring will be conducted in the coming week. ERM-Hong Kong, Limited (ERM) was appointed by NTT Com Asia (NTTCA) as the Environmental Team (ET) to implement the Environmental Monitoring and Audit (EM&A) programme for the installation of a telecommunication cable (Asia-Submarine-cable Express (ASE)) of approximately 7,200 km in length, connecting Japan and Singapore with branches to the Philippines, Hong Kong SAR (HKSAR) and Malaysia (thereinafter called the Project). 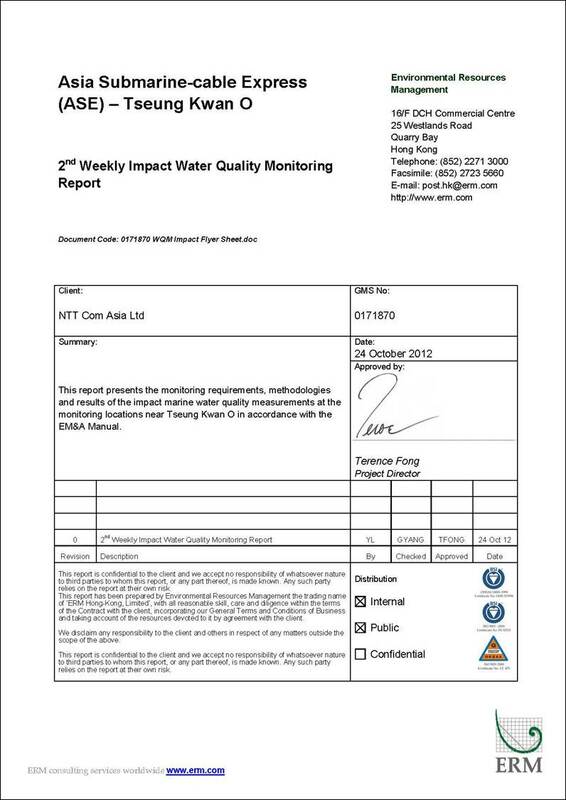 This is the Second Weekly Impact Water Quality Monitoring Report, which summarises the results of impact water quality monitoring as part of the EM&A programme during the reporting period from 15 October 2012 to 21 October 2012. NTT Com Asia (NTTCA) proposes to install a telecommunication cable (Asia Submarine-cable Express (ASE) cable) of approximately 7,200 km in length, connecting Japan and Singapore with branches to the Philippines, Hong Kong SAR (HKSAR) and Malaysia. NTTCA is responsible for securing the approval to land the ASE cable in Tseung Kwan O, Hong Kong SAR (HKSAR). The proposed landing site will be at a new Beach Manhole (BMH) and ultimately connect with a Data Centre in Tseung Kwan O (TKO) Industrial Estate which is scheduled for completion in 2012. From Tseung Kwan O, the cable will extend eastward approaching the Tathong Channel. Near to Cape Collinson, the cable is approximately parallel to the Tathong Channel until north of Waglan Island where the cable travels eastward to the boundary of HKSAR waters where it enters the South China Sea. The total length of cable in Hong Kong SAR waters is approximately 33.5 km. A map of the proposed cable route is presented in Figure 2.1. 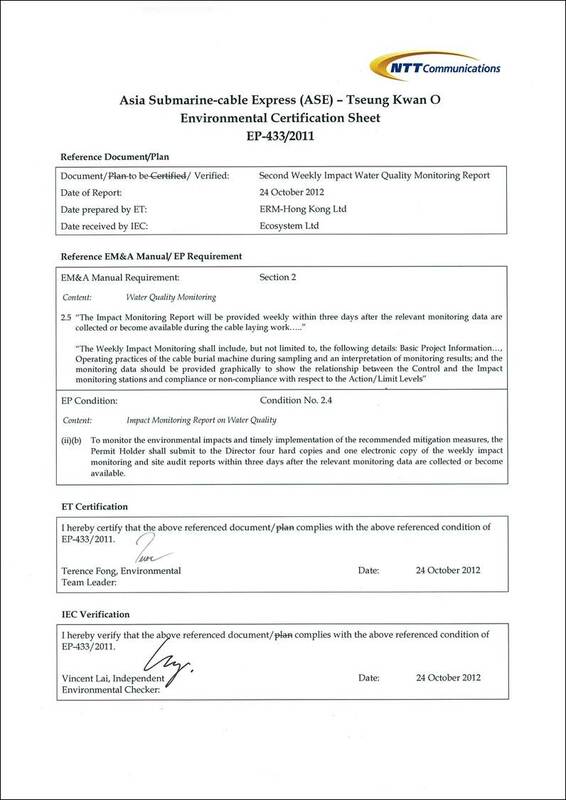 A Project Profile (PP-452/2011) which includes an assessment of the potential environmental impacts associated with the installation of the submarine telecommunications cable system was prepared and submitted to the Environmental Protection Department (EPD) under section 5. (1)(b) and 5. (11) of the Environmental Impact Assessment Ordinance (EIAO) for the application for Permission to apply directly for Environmental Permit (EP). The Environmental Protection Department, subsequently issued an Environmental Permit (EP- 433/2011). Pursuant to Condition 2.4 of the EP, an environmental monitoring and audit programme as set out in the Environmental Monitoring and Audit Manual (EM&A Manual) is required to be implemented. 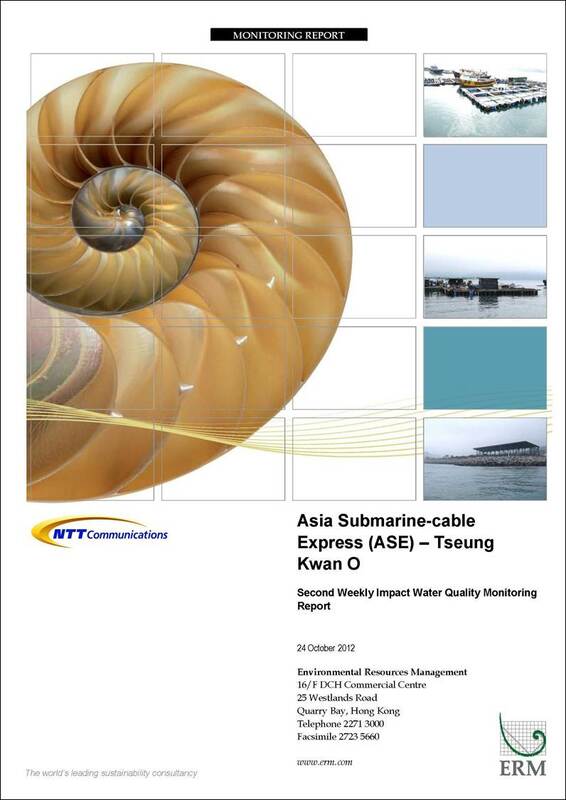 In accordance with Section 2 of the EM&A Manual, impact monitoring of marine water quality should be undertaken when the cable installation barge works in Zone A , Zone B and Zone C.
Impact monitoring started on 8 October 2012 in parallel with the submarine cable laying works in Zone A and Zone B. During this reporting week, the impact monitoring was continually conducted on a daily basis as the cable laying works proceeded in Zone C and ceased when the barge moved outside Zone C. This Report therefore presents the monitoring results from the monitoring stations within Zone C. .
During the reporting period from 15 October 2012 to 21 October 2012, submarine cable laying works were conducted in Zone C and from Zone C eastward to the boundary of Hong Kong marine waters. A summary of the relevant permits, licences and reports on environmental protection for this Project is presented in Table 2.1. In accordance with the EM&A Manual, during the installation of the cable system in Zone C, water quality samplings were collected at the stations situated around the cable laying works in Zone C. The locations of the sampling stations within Zone C are shown in Figure 3.1. · C3 is a Control Station (approximately 3 km from the proposed cable alignment) for Zone C. It is not supposed to be influenced by the cable laying works due to its remoteness to the construction works. The co-ordinates of the above monitoring stations in Zone C are listed in Table 3.1. The impact water quality monitoring was conducted in accordance with the requirements stated in the EM&A Manual. Monitoring parameters are presented as below. In-situ data and SS data were collected during the cable installation works from 7:00 to 23:00 on a daily basis. The impact monitoring schedule for the reporting period is presented in Annex A. Impact monitoring at E4, E5, G5, G6 and C3 was commenced once the cable installation works started within Zone C. The monitoring ceased once the cable installation barge moved outside Zone C or no cable laying works were being undertaken within Zone C.
Due to the weather conditions and travelling time between stations, in-situ and SS measurements were taken at the impact monitoring stations with approximately 2-hour interval in Zone C. The monitoring frequency and parameters for water quality impact monitoring are summarised in Table 3.3. Duplicate samples were collected from each of the monitoring events for in situ measurements and laboratory analysis. Each station was sampled and measurements/ water samples were taken at three depths, namely, 1 m below water surface, mid-depth and 1 m above sea bed, except where the water depth less than 6 m, the mid-depth station may be omitted. For stations that are less than 3 m in depth, only the mid-depth sample was taken. For in situ measurements, duplicate readings were made at each water depth at each station. Duplicate water samples were collected at each water depth at each station. All in situ monitoring instruments were checked, calibrated and certified by a laboratory accredited under HOKLAS or any other international accreditation scheme before use, and subsequently re-calibrated at-monthly intervals throughout all stages of the water quality monitoring. Responses of sensors and electrodes were checked with certified standard solutions before each use. Water samples for SS measurements were collected in high density polythene bottles, packed in ice (cooled to 4° C without being frozen), and delivered to a HOKLAS laboratory as soon as possible after collection. The Action and Limit levels for Zones C, which were established based on the results of Baseline Water Quality Monitoring Report (Zone C), are presented in Table 3.4. The Event and Action Plan for water quality monitoring which was stipulated in EM&A Manual is presented in Table 3.5. Step 4 - discuss with cable installation contractor the most appropriate method of reducing suspended solids during cable installation (e.g. reduce cable laying speed/volume of water used during installation). Step 5 - repeat measurements after implementation of mitigation for confirmation of compliance. Step 6 - if non compliance continues - increase measures in Step 4 and repeat measurements in Step 5. If non compliance occurs a third time, suspend cable laying operations. Undertake Steps 1-5 immediately, if further non compliance continues at the Limit Level, suspend cable laying operations until an effective solution is identified. A total of two monitoring events were scheduled in the reporting period between 15 October 2012 and 21 October 2012 (Annex A). Monitoring events at all designated monitoring stations within Zone C were performed on schedule. No major activities influencing the water quality were identified during the reporting period. Continuous water sampling was taken at the impact monitoring stations in Zone C at approximately 2-hour intervals on a daily basis. In general, water quality in Zone C was stable throughout each sampling day though natural fluctuation existed. Neither sudden drop in dissolved oxygen concentrations nor sharp increase in turbidity levels and suspended solid levels were observed on each monitoring day. The results of the impact monitoring and their graphical presentations are included in Annex C.
Despite relatively stable water quality, exceedances of the Action and Limit Levels were recorded during the reporting week. A summary of stations where exceedances were recorded is presented in Table4.1. Exceedances with detailed information of location and time were presented in Annex C.
According to the daily barge operation report, there were some preparation and maintenance works carried out by the Contractor before burial operation. The burial operation (i.e. jetting works) was conducted from 10:15 to 18:30 on 15 October 2012, which overlapped with the marine water quality monitoring. Jetting works for the Project were not being undertaken when the exceedances in middle DO, depth-averaged Turbidity and depth-averaged SS were recorded at E4 and E5 in the 1st (07:00 – 09:00), 2nd (09:07 – 10:07) and 8th (21:01 – 22:52) rounds of marine water quality monitoring. Therefore, the exceedances of the Action and Limit Levels at E4 and E5 are considered to represent natural background fluctuations. During 3rd and 4th rounds of water sampling, the mean depth-averaged Turbidity and mean depth-averaged SS at Impact Station E4 and E5 where exceedances were recorded are similar to the average levels at Control Station C3 (Turbidity = 1.67 NTU, SS = 2.60 mg/L). Since Control Station C3 is far away (~3 km) from the jetting locations and should not be affected by the Project, the similar levels between impact stations and the control station would indicate that the exceedances observed at the Impact Station E4 and E5 were unlikely to be caused by the jetting works but represented natural background fluctuations during monitoring period. Turbidity: E4=1.52 NTU; E5=1.63 NTU. SS: E4=2.53 mg/L; E5=2.67 mg/L. Turbidity: E4=1.77 NTU; E5=1.69 NTU. SS: E4=2.78 mg/L; E5=2.68 mg/L. Turbidity: E4=1.73 NTU; E5=1.61 NTU. SS: E4=2.75 mg/L; E5=2.60 mg/L. Turbidity: E4=1.69 NTU; E5=1.68 NTU. SS: E4=2.72 mg/L; E5=2.67 mg/L. Exceedance of Action Level in SS: E4 and E5. Exceedance of Limit Level in Middle DO: E5. Exceedances of Action Level in depth-averaged Turbidity and depth-averaged SS were recorded at StationsE4 and E5 in all eight sampling rounds on 16 October 2012. Additionally, exceedances of Action and Limit Levels in middle/bottom DO were recorded at Station E4 in the 5th, 6th and 8th sampling rounds (Table 4.3). According to the daily barge operation report, there were some preparation and maintenance works carried out by the Contractor before burial operation. It is also noted the bad sea condition (i.e. strong swell) in the morning which only allows the burial operation (i.e. jetting works) to have been conducted between 15:20 to 19:20 on 16 October 2012, which overlapped with the marine water quality monitoring. As stated above, jetting works for the Project were not being undertaken when the exceedances in depth-averaged Turbidity and depth-averaged SS were recorded at E4 and E5 in the first four rounds of marine water quality monitoring (07:00 – 15:01). Therefore, the exceedances of Action Levels at E4 and E5 in this period are considered to represent natural background fluctuations. During the 5th, 6th,7th and 8th rounds of water sampling, the mean depth-averaged Turbidity and mean depth-averaged SS levels at Impact Station (E4 and E5) where exceedances were recorded were lower than the average levels at Control Station C3 (Turbidity = 1.70 NTU, SS = 2.74 mg/L). Since the control station is far away (~3 km) from the jetting locations and should not be affected by the Project, the lower Turbidity and SS levels at impact stations than those at Control Station C would indicate the exceedances observed at the Impact Station E4 and E5 were unlikely to be caused by the jetting works but represent natural background fluctuations during the monitoring period. During the 5th and 6th rounds of water sampling, exceedances of Action and Limit levels in middle DO were recorded at the impact station E4. However in the same sampling rounds, the middle DO values were recorded to be compliant with the Action Level at both gradient stations G5 and G6, which are situated between the cable installation barge and E4 and should be more susceptible to the impact of the Project (if any). Therefore the exceedances measured at E4 in the 5th and 6th rounds, as well as in the last round when cable installation works of the Project were ceased for the day, were unlikely to be caused by the jetting works but represent natural background fluctuations during monitoring events. Turbidity: E4=1.49 NTU; E5=1.63 NTU. SS: E4=2.47 mg/L; E5=2.50 mg/L. Turbidity: E4=1.82 NTU; E5=1.67 NTU. SS: E4=2.80 mg/L; E5=2.73 mg/L. Turbidity: E4=1.71 NTU; E5=1.55 NTU. SS: E4=2.68 mg/L; E5=2.57 mg/L. Turbidity: E4=1.73 NTU; E5=1.65 NTU. SS: E4=2.78 mg/L; E5=2.67 mg/L. Turbidity: E4=1.50 NTU; E5=1.58 NTU. Turbidity: E4=1.57 NTU; E5=1.68 NTU. SS: E4=2.62 mg/L; E5=2.70 mg/L. Turbidity: E4=1.53 NTU; E5=1.71 NTU. SS: E4=2.55 mg/L; E5=2.68 mg/L. Turbidity: E4=1.52 NTU; E5=1.68 NTU. Exceedance of Action Level in Middle DO: E4. Exceedance of Action and Limit Levels in Middle DO: E4. Exceedance of Action Level in Bottom DO: E4. Exceedances of the Action and Limit Levels were recorded during the reporting period. The Event and Action Plan for the identified exceedances were implemented and followed the procedures as stipulated in the EM&A Manual and Table 3.5. It was concluded that the exceedances were considered to reflect natural background fluctuation rather than the impact caused by the Project (See Section 4.2 for details). The cable installation works will be continually conducted outside Zone C (from Zone C eastward to the boundary Hong Kong marine waters). Based on the current construction programme, no impact water quality monitoring will be carried out since no jetting works will be undertaken within Zone A, Zone B or Zone C.
This Weekly Impact Monitoring Report presents the results of impact water quality monitoring undertaken in Zone C during the period from 15 October 2012 to 21 October 2012 in accordance with the EM&A Manual and the requirements under Environmental Permit (EP - 433/2011). Water quality in Zone C was generally stable throughout the sampling period. Neither sudden drop in dissolved oxygen concentrations nor sharp increase in turbidity levels and suspended solid levels were observed. Exceedances of Action and Limit Levels were recorded during the reporting week, but they are considered to reflect natural background fluctuation rather than impact caused by the Project. It is concluded that no deterioration of water quality was observed and hence the impact of the Project on water quality is considered to be negligible.